University of Alaska-Fairbanks (UAF) carries out surveys of glaciers in Alaska as part of Operation IceBridge. 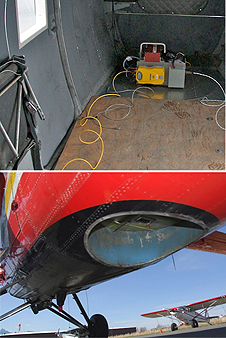 Their chief instrument is a compact scanning laser altimeter that can fly on smaller aircraft such as the DeHavilland DHC-3 Otter. This laser altimeter collects 10,000 data points per second and has a scan angle of 30 degrees to either side from straight down, which gives a swath width roughly equal to aircraft height. This instrument is flown at a maximum of 1500 feet, though lower and slower flights can yield higher density swaths.